trace 2). Dentate neurons innervate hippocampal pyramidal neurons (triangles: 3, 4), which fire single action potentials in response to dentate input (right panel, trace 3). Status epilepticus typically causes death of pyramidal cells (owing to overactivation of NMDA receptors and excessive Ca2+ entry, as discussed in Section 4.2.) but spares dentate neurons (Fig. 7B). Therefore, axons of dentate neuron 1 are left without a postsy-naptic target, so they turn around and wind their way back to innervate their own dendrites and those of neighboring dentate neurons, forming "autoexcitatory," reverberating excitatory circuits (Fig. 7B, left). Now, dentate neuron 2 receives excessive excitatory input and fires multiple action potentials, causing surviving pyramidal neurons to do the same (trace 3). Rather than being unique to hippocampus, sprouting may comprise a more general mechanism by which brain circuits become hyperexcitable. 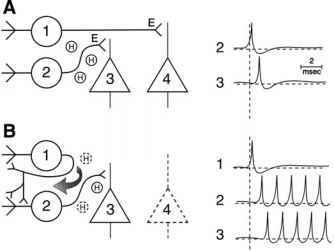 However, the circuit diagram in Fig. 7 is oversimplified. In fact, interspersed between the dentate granule cells and the pyramidal neurons (in the dentate "hilus," labeled H) are many other types of neuron and interneuron, some excitatory, others inhibitory. 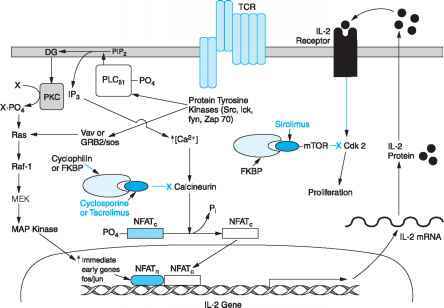 Depending on which of hilar neurons are silenced (by seizure-induced cell death) or activated by seizure activity, the physiology of the circuit could be vastly altered (39). This synaptic flexibility is an example of seizure-induced plasticity and can give rise to complicated circuits that can either compensate for or exacerbate the initial seizure situation. To make matters even more complicated, seizures can induce neurogenesis in certain areas of the brain, that is, the birth of new neurons (even in the adult brain). This phenomenon is especially prominent in the dentate gyrus. Again, it can give rise to increased or decreased excitability depending on the connectivity and type of newly born neurons. The role of neurogenesis in epileptogenesis is being investigated (40). In addition to injury-induced alterations of structural neuronal networks, neural circuits can also be naturally epileptic. Children with abnormal brain development (dysge-nesis) have a high predisposition to epilepsy. Aided by advances in neuroimaging, especially MRI, an ever-increasing number of dysgenetic cortical lesions is being delineated. Some of these lesions are quite subtle yet are sufficient to comprise an epileptic circuit (41). Disruption at any step in the complex sequence of brain development, e.g., neuronal proliferation, migration, synaptogenesis, can lead to abnormal circuit function and epilepsy. Examination of dysgenetic cortical tissue from animals with experimentally induced abnormal brain development reveals widespread evidence of hyperex-citable circuitry (42).